Between the rise of food intolerances and a growing awareness of what constitutes a healthy diet, our food preferences are changing fast. 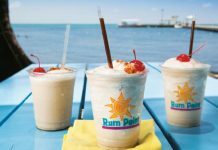 Many Cayman restaurants are responding to popular demand with re-designed menus that can be modified for those with allergies or intolerances, and that cater to customers on special diets. A number of new establishments are taking it a step further and focusing exclusively on fresh, local produce and nutritionally balanced meals. With everything from gluten and dairy free meals to vegan menus and Paleo-friendly options at the following restaurants, you’ll not only find sustenance when dining out – you may also be inspired to recreate some of the inventive recipes at home. Lighthouse Point Resort, Grand Cayman’s first eco-hotel, is a fitting location for VIVO Café, a waterfront eatery that sources as many ingredients as possible from local producers. The restaurant offers a strictly vegetarian and vegan menu, including gluten-free and raw options too, offering diners a selection of deliciously healthy options that are good for mind, body, and soul. The primarily plant-based menu has been devised by chef Gilbert, who has more than 30 years of culinary experience. Specials are added regularly, while menu options may change depending on the availability of ingredients. Popular menu items include the “Sun Day Roast,” lentil, herbs, and mushroom loaf, chili, garlic, wilted greens, moringa potatoes, mushroom gravy, and cranberry chutney; the “Aglio, Olie e Peproncino,” pasta with olive oil, garlic, fresh herbs, wilted greens, seasoning peppers, chili, Parmigiano, and raw Manchego cheese; “Coconut Ceviche,” coconut, cucumber, chili, onions, coconut bacon, and spicy nuts, with a coconut-lime dressing; and the “Sprouted Spelt Flatbread Burrito,” featuring beans, tomato chili sauce, avocado, raw Manchego cheese, coconut and cashew cream. The one non-vegetarian exception on the menu is lionfish, sourced direct from divers during lionfish culls. Popular lionfish dishes include the Indian lionfish curry and the lionfish sandwich, served on a homemade Dutch-crust bun. Bread and Chocolate’s signature dish is French toast stuffed with chocolate hazelnut butter and bananas, dipped in coconut and tahini batter and topped with fresh fruit, with an optional side of homemade coconut ice cream. 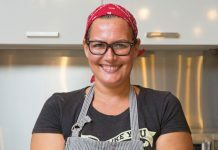 Although only a tiny fraction of the population follows a vegan diet full-time, since Bread and Chocolate opened in 2013, residents have been flocking to Cayman’s first 100 percent vegan bistro in droves. 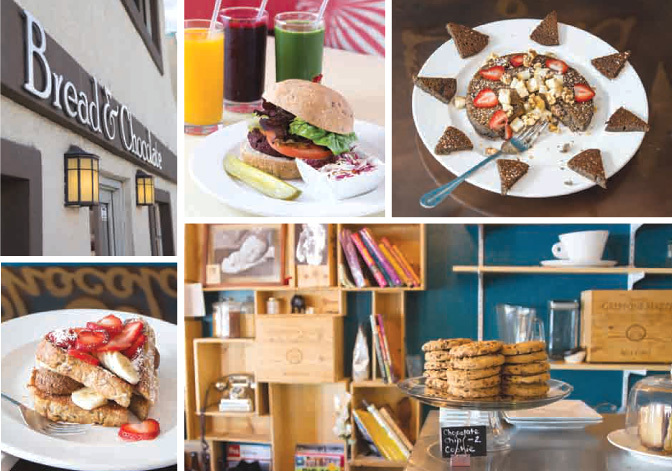 The secret to the café’s success may well lie in the fact that while it caters to a health-conscious clientele, the menu still includes plenty of sweet treats, and naughty tasting options. Owner Agatha Kalicki, who has herself followed a vegan diet for several years, wanted to offer food that was healthy but also exciting. The signature dish, for instance, is French toast stuffed with chocolate hazelnut butter and bananas, dipped in coconut and tahini batter and topped with fresh fruit, with an optional side of homemade coconut ice cream. Of course, it’s not all cookies and cakes – there are plenty of hearty, robustly flavored breakfast and lunch choices that prove there is much more to vegan food than lentils, beans, and tofu. Colorful, filling breakfasts include the original breakfast scramble (tofu with onion and turmeric) served with garlic sautéed seasonal greens, oven-roasted home fries, whole grain toast, and seasonal fruit, and corn tacos filled with peppers, onions, and black beans topped with pico de gallo. At lunch, the Angus Beet Burger – a pickapeppa-infused shredded beet, brown rice and a lentil patty, served with fresh garlic aioli, lettuce, tomato and red onion on a whole grain bun – is just as satisfying as its red meat counterpart. While the menu is entirely free from animal-derived products, it recognizes that many diners still enjoy the taste of meat and dairy, and thus includes creative substitutes such as tempeh bacon, cashew cheese and jerk tofu, and coffees come with a range of “milk” options, including almond, oat, hemp and coconut. Agua caters to a wide range of dietary needs, including vegetarian, vegan, gluten-free and Ideal Protein. 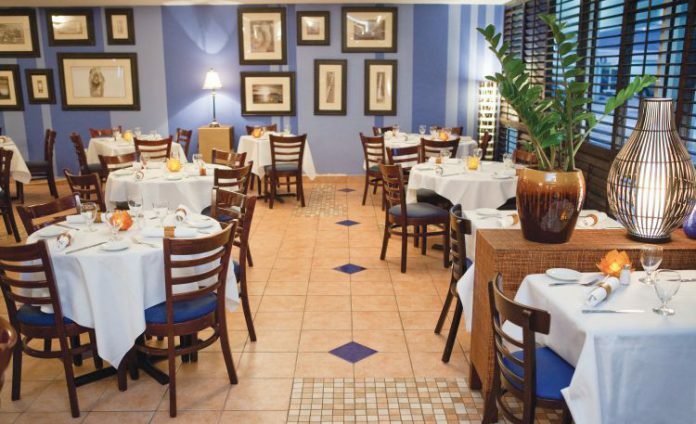 Located in Galleria Plaza, Agua has made a name for itself serving outstanding ceviches and the freshest of seafood. Now it has also become a popular haunt for those with dietary needs offering a wide range of specialty menus, including vegetarian, vegan, gluten-free and Ideal Protein. Drawing on inspiration from Peru, Mexico, Malaysia, India, Austria and Italy for its unique menu offerings, vegans can choose between arugula salad with caramelized walnuts, pears, strawberries and balsamic vinegar; kale salad made with local kale, red beets, pine nuts and raspberry vinaigrette; fritto misto tempura – fried mixed vegetables with a side of guacamole – or an avocado roll made with carrot and sliced almonds, wrapped in a crispy casing. Main course choices include vegan paella prepared in traditional Spanish style, slowly baked in a saffron broth with vegetables; sautéed vegetables in a homemade stir-fry sauce, served with white rice; and a vegan platter of mixed grilled vegetables tossed in a salmoriglio sauce, with chick peas and mixed nuts. The tuna tartare, served with avocado brunoise, white truffle oil and red caviar; the beef carpaccio – thinly sliced beef tenderloin with arugula, shitake and shaved Parmigiano Reggiano – or the Cayman-style fresh catch with vinegar, lime, tomato, red onion, cilantro, Scotch bonnet and orange juice are all delectable, safe choices for the gluten-intolerant, while mahi mahi, red snapper, tuna, lobster, shrimp, chicken or beef fillet can all be simply prepared with a choice of mixed steamed or grilled vegetables or a salad for those following an Ideal Protein diet. Full of Beans’s relaxed approach to healthy food has long been a crowd-pleaser. Fun, friendly and unpretentious, Full of Beans’s relaxed approach to healthy food has long been a crowd-pleaser. Vegetarian, vegan and even sugar-free meals are always available, but if what your body craves is a succulent steak or a plate of tangy Cayman-style shrimp, the menu won’t stop you. Likewise, on the beverage front, the choice ranges from vitamin-laden fresh green juices, through coffee and tea, all the way to wine, beer and espresso martinis. Fresh, light lunches include a selection of vegan wraps, brown rice salads, veggie stir-fries and homemade quiches. Among the restaurant’s many highlights are the roasted pumpkin and spinach salad made with local pumpkin, beets, baby spinach, cranberries, goat cheese and a honey mustard dressing, and the vegetarian healthy heart salad, a medley of roasted vegetables, avocado, cherry tomatoes, brown rice, chili pepper flakes, and a balsamic reduction. Wrap fillings include spicy shrimp with lettuce, avocado, chipotle sour cream and a lemon mustard dressing; arugula with roasted chicken, Parmesan, tomato and pesto mayo, or a healthy vegan wrap with mushrooms, carrots, zucchini, bell peppers, tomato and black bean hummus. For those with a sweet tooth it’s worth noting that Island Naturals’s vegan, gluten-free cheesecake won Best Dessert at Taste of Cayman, 2015. Island Naturals in Coconut Plaza, off West Bay Road, specializes in healthy meals, prepared using organic, sustainable produce, nutrient-packed superfoods and signature fresh juices, smoothies and fruity iced teas. Open for breakfast, lunch and dinner, the menu features vegetarian, vegan and gluten- free choices to eat in or take away. 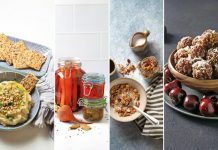 The oatmeals, acai bowls, yogurt parfaits, and gluten-free muffins are an excellent way to infuse the body with nutrients at the start of the day, while the black bean avocado wrap, meatless burritos, and sweet potato or green coconut curry bowls will keep energy levels topped up throughout the day. For a lighter snack the mango pecan or kale and spinach salads are tasty, fresh and satisfying. Dessert items are also prepared daily. For those with a sweet tooth it’s worth noting that their vegan, gluten-free cheesecake won Best Dessert at Taste of Cayman, 2015. Yoshi Sushi’s extensive, authentic Japanese menu includes numerous appetizers, rolls, soups, rice and noodle dishes that are not only clean-tasting and light, but are ideal for vegetarians, vegans, and the lactose and gluten-intolerant. Japanese cuisine, with its liberal use of tofu, soy, rice, seaweed and fresh vegetables and absence of most dairy products, is a natural fit for health-conscious diners. Light snacks such as the agedashi tofu (a soft tofu, tempura battered and fried, topped with tempura sauce and green onion); steamed edamame beans, sprinkled with rock salt, or tossed in ginger, garlic and chili flakes; and the spinach salad with tahini are all ideal to kick off a healthy meal. These can be followed with seafood-free maki sushi rolls wrapped in seaweed and filled with combinations of avocado, mango, pickled radish, cucumber, alfalfa sprouts and Japanese mayo, or soups laden with thick, white udon noodles (these are wheat-based), or egg-based ramen noodles, plus green onions, spinach, seaweed, carrots and shiitake mushrooms. Equally flavorsome are the tofu and vegetable rice bowls stir-fried in a teriyaki sauce. Saucha’s 100 percent plant-based menu includes plenty of raw, unprocessed and seasonal ingredients that are also gluten-free. There’s no excuse for eating junk when you are on-the-go now that Saucha delivers homemade, vegan meals to your home or workplace during the week. The menu changes weekly, so new surprises are always in store, but founders Britta Bush and Danielle Gentilcore are committed to using locally sourced, organic, farm-fresh produce whenever possible, supplemented with sustainably-grown, organic imports when necessary. 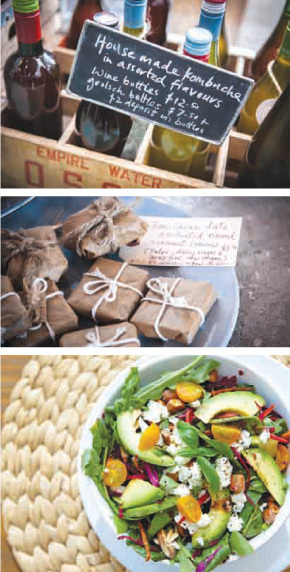 The 100 percent plant-based menu includes plenty of raw, unprocessed and seasonal ingredients that are also gluten-free. Try the signature seasoned walnut taco meat and black beans and rice, served over market greens with guacamole, fresh veggies, lime cilantro vinaigrette and non-GMO organic tortilla chips for a fresh but filling energy boost. The non-deep fried falafel, made with almonds and spiced to perfection with fresh local herbs, served with organic brown rice, fresh vegetables and a dairy-free tzatziki for dipping or drizzling, is equally clean and nutritious. Saucha also brew their own kombucha in small batches, which can be delivered or purchased at various retail outlets across the island. The probiotic-packed, fermented tea comes in various flavors, including Cayman lime, mango ginger and blackcurrant acai, all of which aid digestion and boost energy. Finish off a nutritious meal with one of the top-selling, all natural, vegan desserts: inside-out peanut butter cups; coconut chia pudding; and guava, key lime, mango or cinnamon cheesecake. 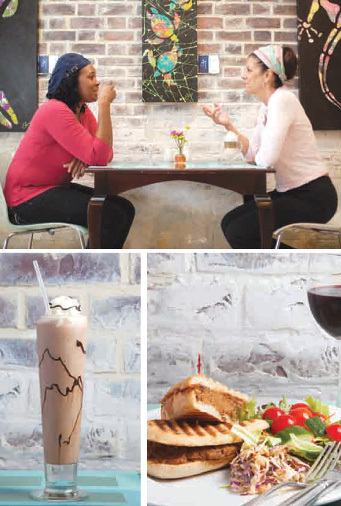 The aim of Jessie’s Juice Bar is to serve intensely nourishing food and drinks that also taste incredible. 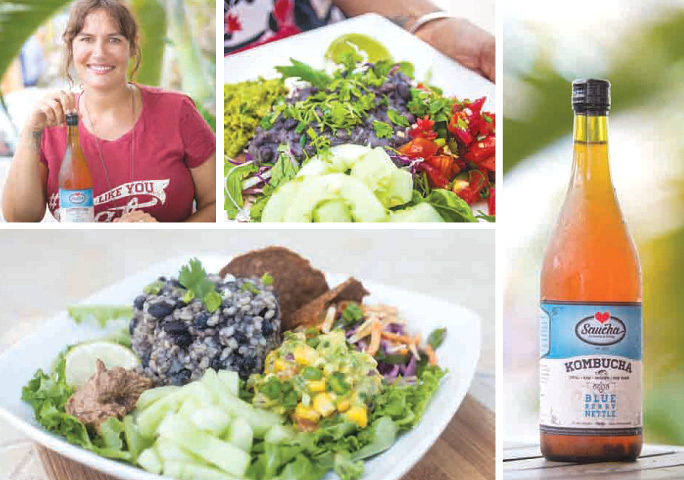 When certified nutritionist Jessie Ormond opened Jessie’s Juice Bar in Camana Bay in 2012, it was with a simple mission: to serve intensely nourishing food and drinks that also taste incredible. Three years on, it seems she has hit upon a winning formula, even opening a similar-themed café/bar called South West Collective along the George Town waterfront. There’s far more than cold-pressed fruit and vegetable juices on offer: liquid refreshments also include loose leaf teas, organic coffees, rich, creamy smoothies and home-brewed kombucha. However, when you need to counteract some overindulgence, the Green Alkaliser (kale, parsley, mint, cilantro, celery, cucumber and watermelon) or the Tickled Clean (pink ginger juice, chai, date, mango and pineapple) may be just the ticket. Both juice and food menus change according to seasonally available local produce, but seeds are sprouted in-house to ensure maximum nutritional benefit, left over pulp from juicing is used to make healthy gluten-free wraps and all dishes are minimally processed. Although some dairy and meat products are used, there are plenty of options for all dietary requirements: all smoothies are vegan and most are also Paleo-friendly, while soups are always gluten and dairy-free and frequently vegan too. Salads, sandwiches and wraps are packed with fresh flavors, and the vegan truffles and banana bread are often gone within minutes of going on display.